After winning the crown with a dominating performance over Gegard Mousasi in April, Lawal’s first title defense will come against Rafael “Feijao” Cavalcante. Although he dons a belt now, he claims it won’t change his mindset come August 21st. It’s his confident approach that has gotten him this far, as the former collegiate wrestler has traded in his singlet for the thick chain he rocks around his neck and the gold around his waist. Cavalcante poses an interesting challenge for King Mo, as eight of the Brazilian’s nine wins have come in some form of knockout. However, you won’t have to tell the champion because he is already on high alert. “Feijao likes to bang so this is going to be an exciting fight. I’m going to show you all some new things I’ve been working on,” Lawal continued. 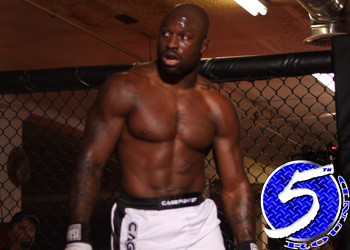 So, how does Strikeforce’s 205-pound title holder prepare for such a dangerous opponent? “I watch about 10-15 fights a day. I’m always studying guys and learning their weaknesses,” the champ stated. One thing you’ll never second guess about Lawal is his ground game. We’ll find out in a few weeks if that’s enough to successfully complete his first title defense.